With unparalleled artistry and exceptional detail, each festive and collectible Keepsake Barbie Ornament is made for years of celebrations. In this video we want to show you new doll Christmas ornaments for winter holidays season 2018 - 2019. Best gift for doll collector and Barbie fans. Carry on the Barbie tradition of fabulous holiday fashions with this Christmas tree ornament featuring the fashionista herself dressed in her holiday best. 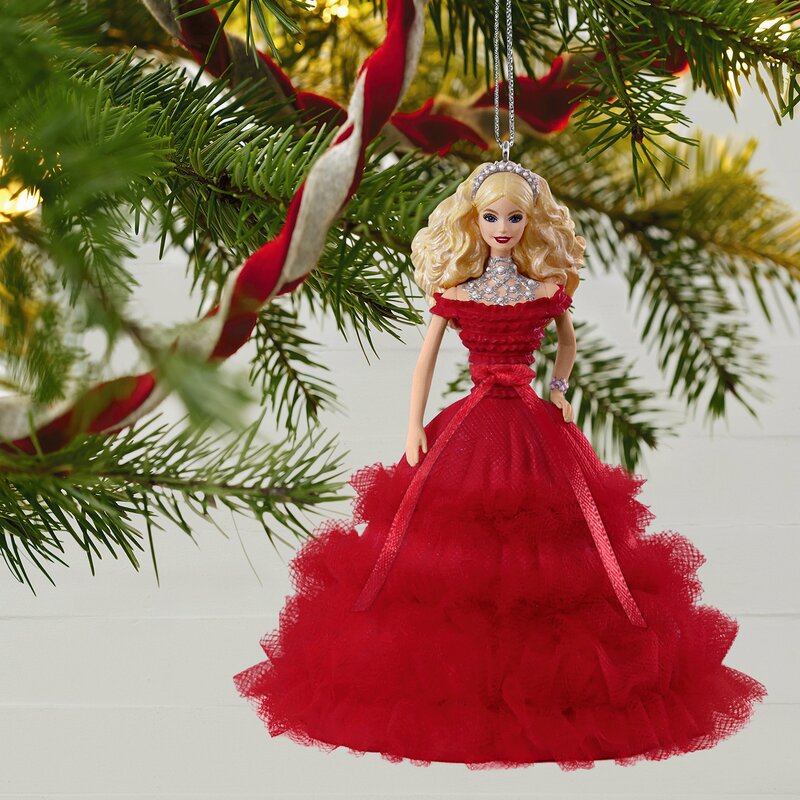 Inspired by the 2018 Holiday Barbie Doll, this dazzling ornament is fourth in the Holiday Barbie series and a must-have for collectors of all ages. Christmas tree ornament is 4th in the Holiday Barbieª series. Artist crafted by Katrina Bricker, this Christmas tree ornament features fabric accents. Pre-packaged in a box for easy gift giving, preservation and storage. Dated 2018 in copyright. With unparalleled artistry and exceptional detail, each festive and collectible Keepsake Ornament is made for years of celebrations. Inspired by the 2018 Holiday Barbie Doll, this dazzling Christmas tree ornament carries on the Barbie tradition of fabulous holiday fashions. 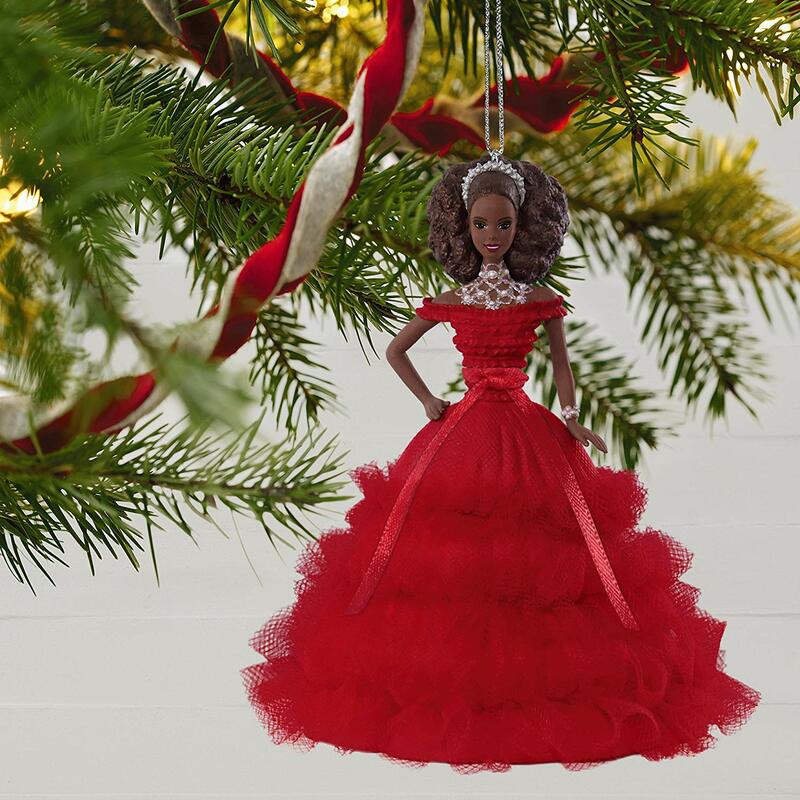 The famous fashionista herself is dressed in her holiday best in this fourth ornament in the Holiday Barbie series. A must-have for collectors of all ages. No matter the era or the clothing style, Barbie knows how to wear it well. 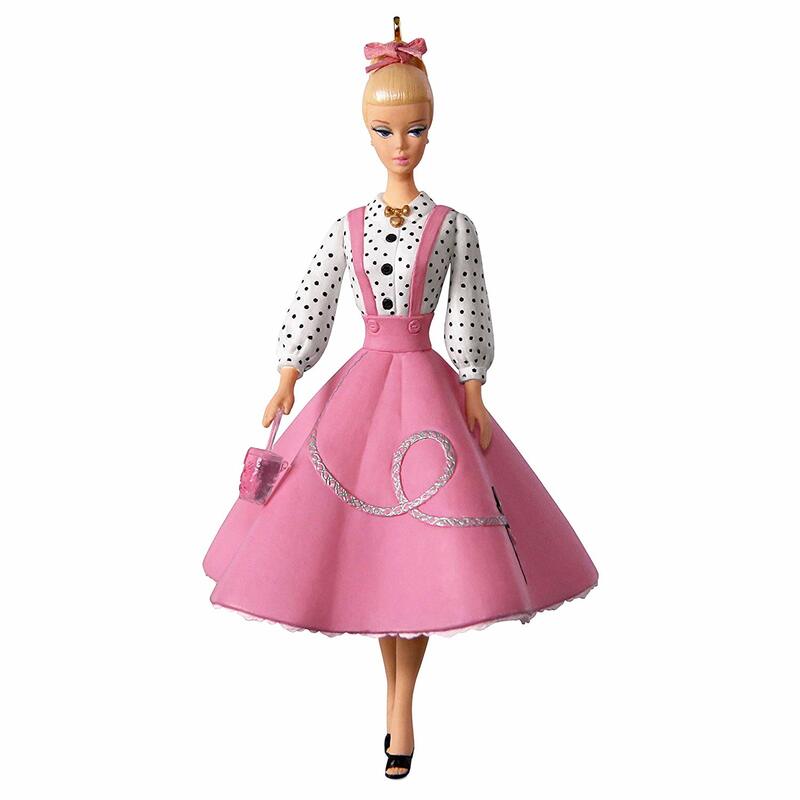 Take a nostalgic trip down memory lane with this charming Christmas tree ornament featuring Barbie dressed in flirty 1950s fashion, from a pink and black poodle skirt and polka-dot blouse to the matching pink bow on her ponytail. She makes the perfect gift for Barbie collectors of all ages. Dressed in pink from her hair bow to her pointe shoes, ballerina Barbie represents every little girl's dream. This sweet Barbie doll Christmas tree ornament is poised and ready to pirouette in her tutu made of real tulle with a golden tiara on her head. Inspired by the popular Barbie Ballet Wishes dolls, this ornament makes a perfect gift to commemorate the year of the first dance recital and for Barbie fans of all ages. Barbie is known for many things, including her signature high heels. This elegant Christmas tree ornament features an iconic Barbie style—the open-toe stiletto—decorated in hot pink metal with dazzling gold star accents, shimmery sparkles and gemstones. A timeless addition to your holiday decor and a must-have for every Barbie collector. Add this stunning beauty to the top of your tree and watch her glow in celebration of the season. This actual-size Barbie is dressed in an elegant formal gown that radiates vibrant color and pattern when you plug the tree topper into a Hallmark power adapter (included). Choose a continuous lighting effect in warm white or pink and blue that glows from the fabric skirt and shoulders. Magic Light Christmas tree topper. 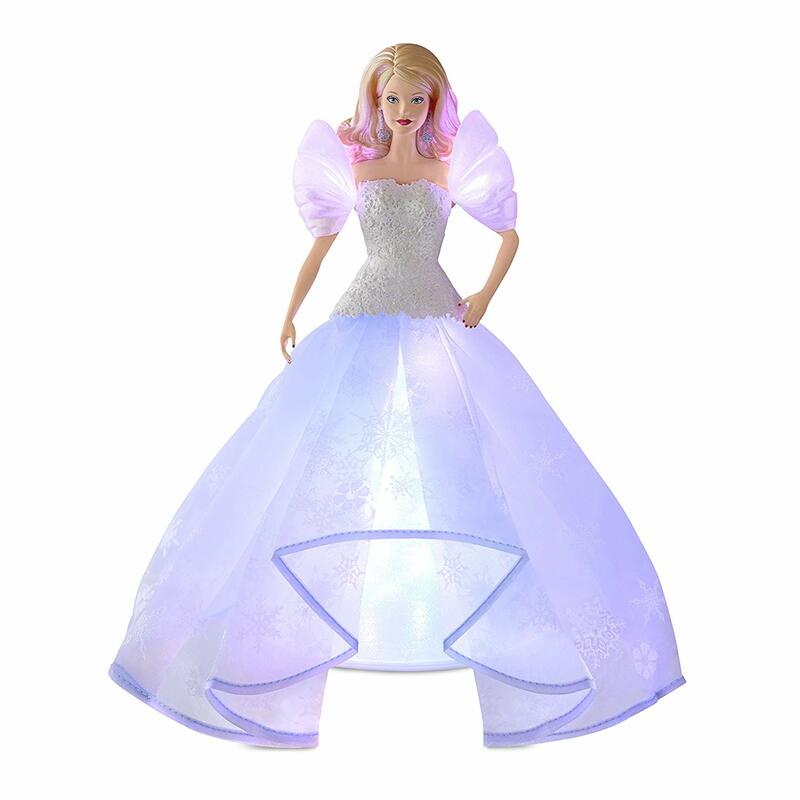 Connect this tree topper to Hallmark's universal power adapter (included) to see Barbie's dress illuminate with a continuous LED light effect. Plugs into a standard 120-volt wall outlet. Artist crafted by Debra Nielsen, Katrina Bricker and Robert Hurlburt, this Christmas tree topper features fabric accents. Pre-packaged in a box for easy gift giving, preservation and storage. Dated 2018 in copyright.